With the release of .NET Core 2.0, Microsoft has the next major version of the general purpose, modular, cross-platform and open source platform that was initially released in 2016. .NET Core has been created to have many of the APIs that are available in the current release of .NET Framework. It was initially created to allow for the next generation of ASP.NET solutions but now drives and is the basis for many other scenarios including IoT, cloud and next generation mobile solutions. In this series, we will explore some of the benefits .NET Core and how it can benefit not only traditional .NET developers but all technologists that need to bring robust, performant and economical solutions to market. This InfoQ article is part of the series ".NET Core". You can subscribe to receive notifications via RSS. When architecting and developing a rich set of APIs using ASP.NET Core 2.1 Web API, it is important to remember this is only the first step to a stable and productive solution. Having a stable environment for your solution is also very important. The key to a great solution includes not only building the APIs soundly, but also rigorously testing your APIs to ensure the consumers have a great experience. This article is a continuation of my previous article for InfoQ called “Advanced Architecture for ASP.NET Core Web API.” Rest assured, you do not have to read the other article to get the benefits from testing, but it may help give you more insight into how I architected the solution I discuss. Over the last few years, I spent a lot of time thinking about testing while building APIs for clients. Knowing the architecture for ASP.NET Core 2.1 Web API solutions may help broaden your understanding. The solution and all code from this article’s examples can be found in my GitHub repository. Let's take a quick moment and look at .NET and ASP.NET Core. ASP.NET Core is a new web framework which Microsoft built to shed the legacy technology that has been around since ASP.NET 1.0. By shedding these legacy dependencies and developing the framework from scratch, ASP.NET Core 2.1 gives the developer much better performance and is architected for cross-platform execution. There are three parts of a good unit test. The first is the Arrange part which is used for setting up any resources that your test may need. In the example above, I do not have any setup, so the Arrange part is empty (but I still keep a comment for it). The next part called the Act is the part that performs the action of the test. In our example, I am calling the data repository for the Album entity type to return the entire set of albums from the data source the repository is using. The last part of the test is when we verify or Assert that the action of the test was correct. For this test, I am verifying that I returned a single album from the data repository. I will be using the xUnit tool for my unit testing throughout this article. xUnit is an open source package for .NET Framework and now .NET Core. We will be looking at the .NET Core version of xUnit that is included when you install the .NET Core 2.1 SDK. 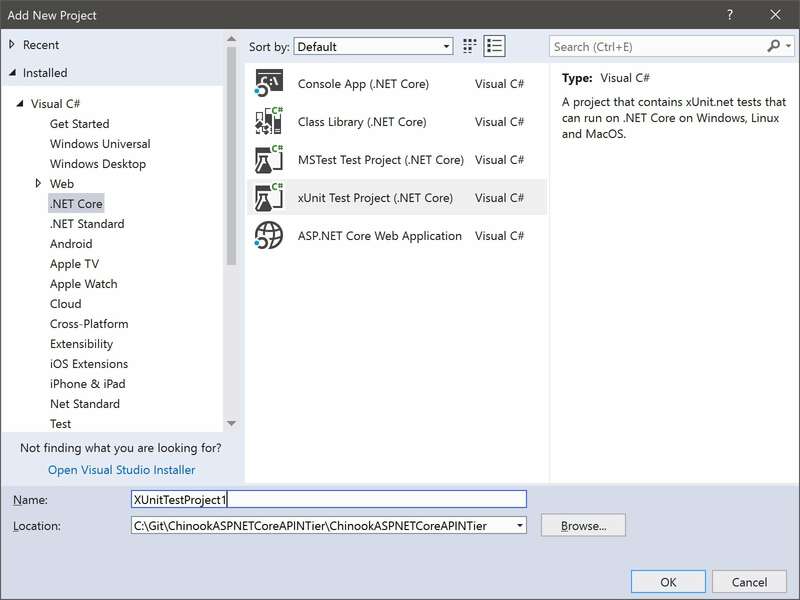 You can create a new Unit Test project either through the .NET Core cli command dotnet test or through the project template in your favorite IDE such as Visual Studio 2017, Visual Studio Code or JetBrain’s Rider. 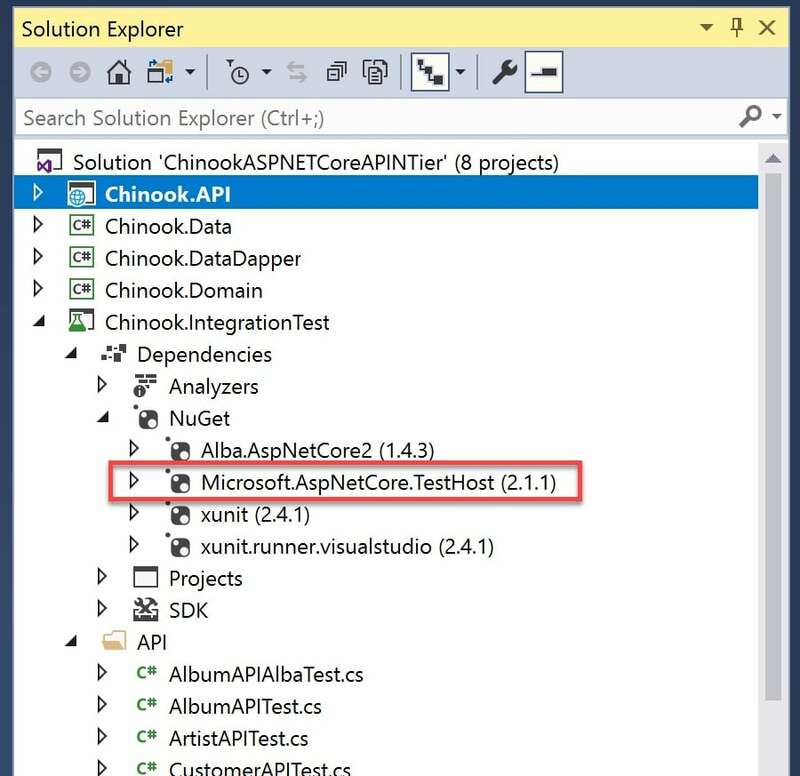 Now let’s dive into unit testing your ASP.NET Core Web API solution. What should be Unit Tested with Web APIs? I am a huge proponent of using unit testing to keep a stable and robust API for your consumers. But I keep a healthy prospectus on how I use my unit tests and what I test. My philosophy is that you unit test your solution just enough and not anymore than necessary. What do I mean by that? I may get a lot of comments from this view, but I am not overly concerned with having 100% coverage with your tests. Do I think that we need to have tests that cover the important parts of the API solution and isolate each area independently to ensure the contract of each segment of code is kept? Of course! I do that, and that is what I want to discuss. Since our demo Chinook.API project is very thin and able to be tested using Integration Testing (discussed later in the article), I find that I concentrate the most with unit tests in my Domain and Data projects. I am not going to go into detail about how you unit test (as that topic goes beyond this article). I do want you to test as much of your Domain and Data projects as you can using data that does not depend on your production database. That is the next topic we’re covering called Mock Data and Objects. Why use Mock Data/Objects with your Unit Tests? We have looked at why and what we need to unit test. It is important to know how to correctly unit test the code for your ASP.NET Core Web API solution. Data is key to testing your APIs. Having a predictable data set that you can test is vital. That is why I would not recommend using production data or any data that can change over time without your knowledge and expectations. We need a stable set of data to make sure all unit tests run and confirm that the contract between the code segment and the test is satisfied. As an example, when I test the Chinook.Domain project for getting an Album with an ID of 42 I want to make sure that it exists and has the expected details like the Album’s name and it is associated with an Artist. I also want to make sure that when I retrieve a set of Albums from the data source, I get the expected shape and size to meet the unit test I coded. Many in the industry use the term “mock data” to identify this type of data. There are many ways to generate mock data for the unit tests, and I hope you create as “real-world” set of data as possible. The better your data you create for your tests, the better your test will perform. I would suggest that you make sure your data is also clean of privacy issues and does not contain personal data or sensitive data for your company or your customer. To meet our need for clean, stable data, I create unique projects that encapsulate the mock data for my Unit Test projects. Let’s call my mock data project for the demo Chinook.MockData (as you can view in the demo source). My MockData project is almost identical to my normal Chinook.Data project. It has the same number of data repositories, and each one adheres to the same interfaces. I want the MockData project to be stored in the Dependency Injection (DI) Container so that the Chinook.Domain project can use it just like the Chinook.Data project that is connected to the production data source. That is why I love dependency injection. It allows me to switch Data projects through configuration and without any code changes. Integration Testing: What is this new testing for Web APIs? After we have performed and verified the Unit Tests for our ASP.NET Core Web API solution, we will look at a different type of testing. I look at Unit Testing to verify and confirm expectations on the internal components of the solution. When we are satisfied with the quality of the internal tests, we can move on to testing the APIs from the external interface, what we call Integration Testing. Integration Tests will be written and performed at the completion of all components, so your APIs can be consumed with the correct HTTP response to verify. I look at unit tests as testing independent and isolated segments of code while the integration tests are used to test the entire logic for each API on my HTTP endpoint. This testing will follow the entire workflow of the API from the API project’s Controllers to the Domain project Supervisor and finally the Data project’s Repositories (and back the entire way to respond). To leverage your existing knowledge of testing, the Integration Testing functionality is based on current unit testing libraries. I will use xUnit for creating my integration tests. 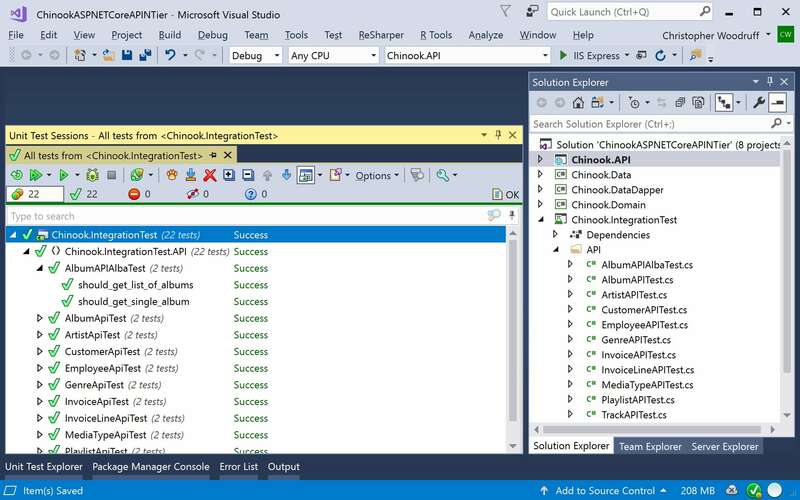 After we have created a new xUnit Test Project named Chinook.IntegrationTest, we need to add the appropriate NuGet package. Add the package Microsoft.AspNetCore.TestHost to Chinook.IntegrationTest project. This package contains the resources to perform the integration testing. We can now move on to creating our first integration test to verify our API externally. To start with the external testing of all of the APIs in our solution, I am going to create a new folder called API to contain our tests. I will also create a new test class for each of the Entity types in our API domain. Our first integration test will cover the Album entity type. Create a new class called AlbumAPITest.cs in the API folder. We will now add the following namespaces to our file. We now have to set up the class with our TestServer and HttpClient to perform the tests. We need a private variable called _client of type HttpClient that will be created based on the TestServer initialized in the constructor of the AlbumAPITest class. The TestServer is a wrapper around a small web server that is created based on the Chinook.API Startup class and the desired development environment. In this case, I am using the Development environment. We now have a web server that is running our API and a client that understand how to call the APIs in the TestServer. We can now write the code for the integration tests. 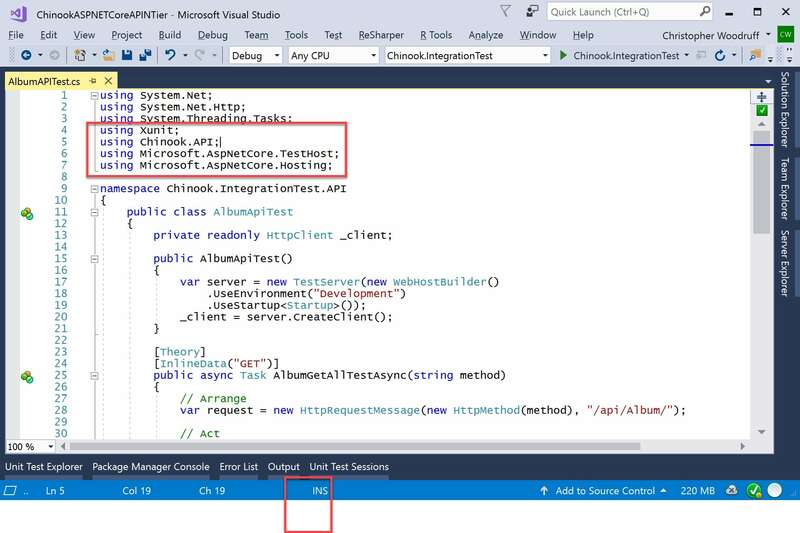 In addition to the constructor code, Figure 4 also shows the code for our first integration test. The AlbumGetAllTestAsync method will test to verify that the call to get all Albums from the API works. Just like in the previous section where we discussed unit testing, the logic for our integration testing also using the Arrange/Act/Assert logic. We first create an HttpRequestMessage object with the HTTP verb supplied as a variable from the InlineData annotation and the URI segment that represents the call for all Albums (“/api/Album/”). We next will have the HttpClient _client send an HTTP Request, and finally, we will check to verify if the HTTP Response meets our expectations which in this case is a 200 OK. I have shown in Figure 4 two ways to verify our call to the API. You can use either, but I prefer the second way as it allows me to use the same pattern for checking responses to specific HTTP Response Codes. We can also create integration tests that need to test for specific entity keys from our APIs. For this type of test, we will add additional value to the InlineData annotation that will be passed through the AlbumGetTestAsync method parameters. 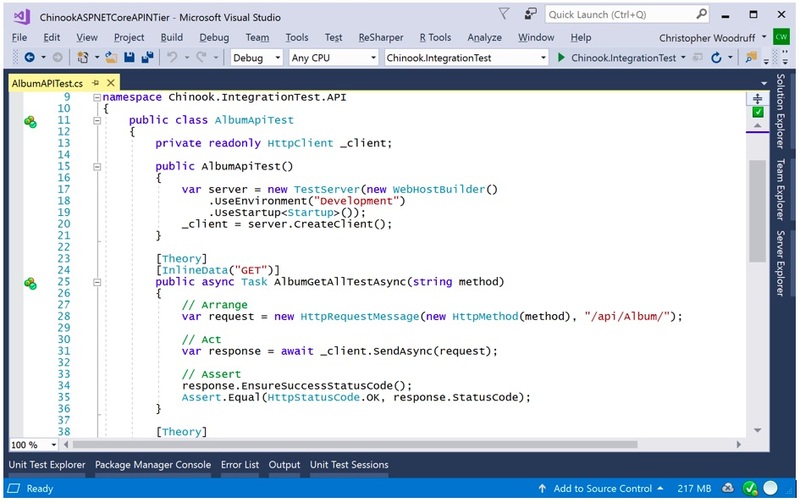 Our new test follows the same logic and uses the same resources as the previous test, but we will pass the entity key in the API URI segment for the HttpRequestMessage object. You can see the code in Figure 5 below. After you have created all of your integration tests to test your API, you will need to run them through a Test Runner and make sure they all pass. All of the tests you have created can also be performed during your DevOps Continuous Integration (CI) process to test your API during the entire development and deployment process. You should now have an execution path for keeping your API well tested and maintained through the development, quality assurance, and deployment phases for the consumers of your APIs to have a great experience without incidents. 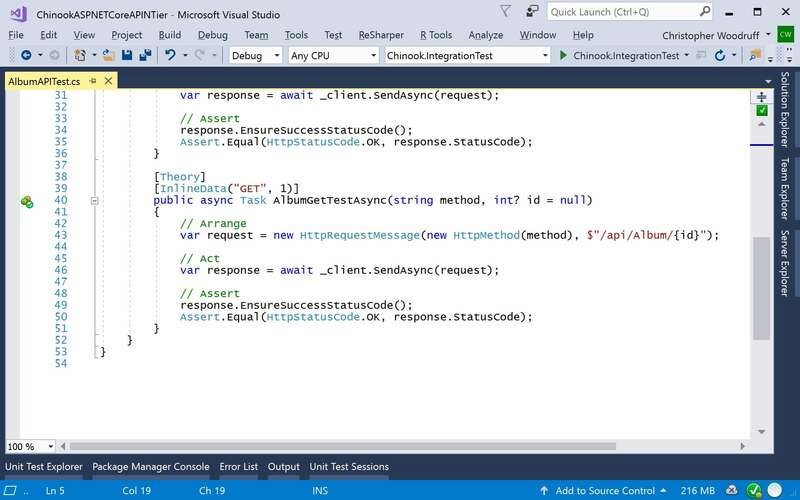 Having a well thought-out test plan using both unit testing for internal testing and integration testing for verifying external API calls is just as important as the architecture you created for the development of your ASP.NET Core Web API solution. Chris Woodruff (Woody) has a degree in Computer Science from Michigan State University’s College of Engineering. Woody has been developing and architecting software solutions for over 20 years and has worked in many different platforms and tools. He is a community leader, helping such events as GRDevNight, GRDevDay, West Michigan Day of .NET and CodeMash. He was also instrumental in bringing the popular Give Camp event to Western Michigan where technology professionals lend their time and development expertise to assist local non-profits. As a speaker and podcaster, Woody has spoken and discussed a variety of topics, including database design and open source. He has been a Microsoft MVP in Visual C#, Data Platform and SQL and was recognized in 2010 as one of the top 20 MVPs world-wide. Woody is a Developer Advocate for JetBrains and evangelizes .NET, .NET Core and JetBrains' products in North America. Nice article, but I would recommend using Postman instead for integration testing APIs. It is built specifically for that purpose, and provides support for environments, environment variables, request chaining, mock servers, active monitoring, and much more. Excellent article, thanks for some new ideas. One comment, however, one you expected already. The world is littered with software that is good but visibly flawed. My clients have never accepted anything but 100%. I can't always charge for all my testing but I sleep better when I overtest everything before release. It is a value judgment on when to stop testing but if you are running your own business, you had better overtest or you will not be in business for long. I agree that Postman is a great tool for APIs and I use it all the time to look at the workflows of my and other's APIs. The great thing about the Integration Testing I write about is it can be included with DevOps workflows. Thanks for the comment and Happy New Year! Nice comment and always a balancing act especially for consultants.